Kilmory to Ardnamurchan lighthouse. 14 Miles. Today was a beautiful sunny day and it really felt like the beginning of summer. Because of the logistics of getting from A to B and then getting from B to C, I decided that what I would have to do was forego the walk around the northern point of Ardnamurchan peninsula but walk to Sanna and from there on to the lighthouse which marks the most westerly point on the mainland. I had left my bike at the lighthouse the previous night and I planned to cycle the 6 miles back to Kilchoan. 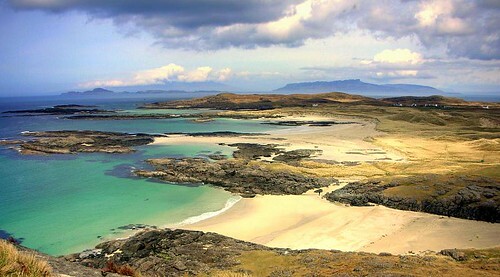 I must say that Sanna Beach is the one of the finest beaches in Scotland. 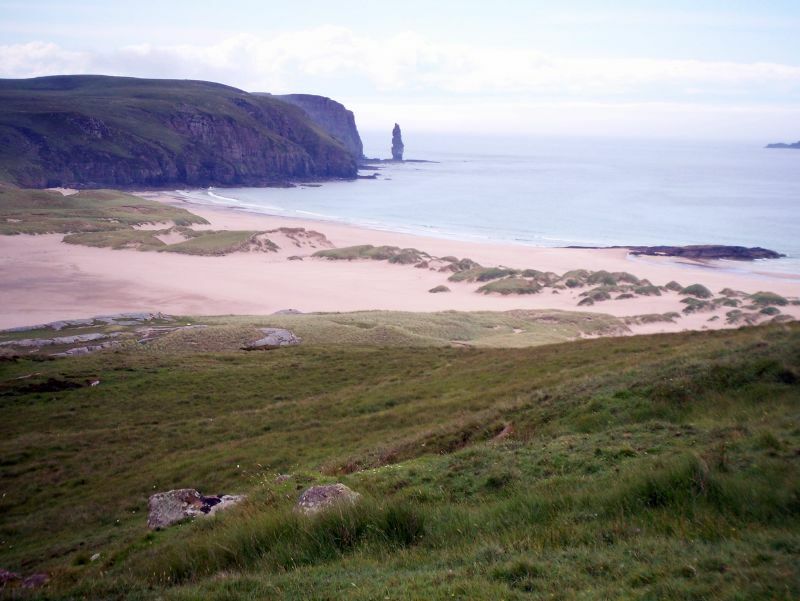 Apart from Sandwood Bay in Caithness, I have not come across a beach with such lovely silver sand, turquoise seas and stupendous views. The photo above gives an indication of what Im raving about, but like every photo, it cant really describe what a place is really like. I met a couple from Teeside who were also blown away by the beauty of the place and they said that they had tried to interest their own kids by describing what it was like. But I think some things have to be experienced and no amount of words can convey the whole experience. It is also about the smell of the sea, the feeling of warm wind on your face, and the 180 degree panorama of beautiful mountainous islands lying just offshore that make it special. For anyone reading this blog, I would recommend visiting Sanna – a remote and desolate piece of heaven. Just above Sanna, I met this lady who had the best job ever. 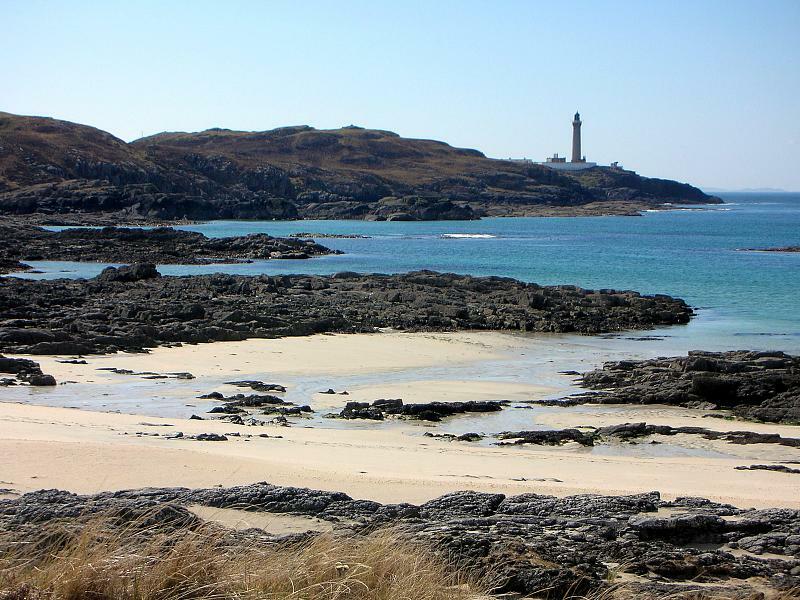 Her job was to tour around Ardnamurchan and mark sights of “Special Scenic Interest”. I thought by God I could do that – and get paid too! I climbed the hill above the little hamlet of Portuaik and lay on the heather taking it all in. Then I headed over to Ardnamurchan lighthouse and had coffee in the visitor centre there. I chatted to the lady who worked there whose husband drives the Shiel bus that travels the tortuous single track road from Kilchoan back to Fort William. After stopping for a time I walked back to pick up my bike which was left further down the hill. Unfortunately on the first hill I snapped the chain and had to push the bike the last 6 miles back to Kilchoan. That wasn’t a problem as it was a lovely evening and I was in no rush to end such a fantastic walk. When I got back to my van which I had parked in the car park of the local village community centre, I had a hot shower and felt on top of the world. Days like today make it all worthwhile. This entry was posted on Wednesday, April 23rd, 2008 at 11:39 pm and is filed under life, photography, Scotland, trail, Travel, trek, walk. You can follow any responses to this entry through the RSS 2.0 feed. You can leave a response, or trackback from your own site.